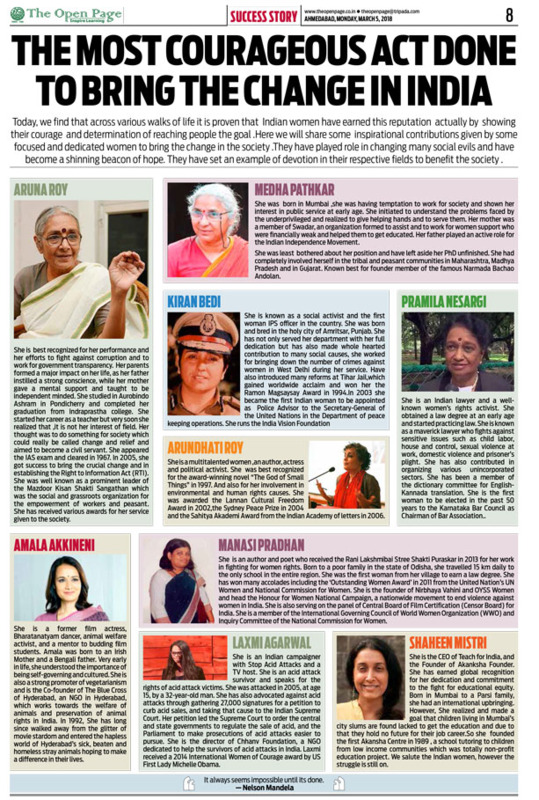 Today, we find that across various walks of life it is proven that Indian women have earned this reputation actually by showing their courage and determination of reaching people the goal .Here we will share some inspirational contributions given by some focused and dedicated women to bring the change in the society .They have played role in changing many social evils and have become a shinning beacon of hope. They have set an example of devotion in their respective fields to benefit the society . She is best recognized for her performance and her efforts to fight against corruption and to work for government transparency. Her parents formed a major impact on her life, as her father instilled a strong conscience, while her mother gave a mental support and taught to be independent minded. She studied in Aurobindo Ashram in Pondicherry and completed her graduation from Indraprastha college. She started her career as a teacher but very soon she realized that ,it is not her interest of field. Her thought was to do something for society which could really be called change and relief and aimed to become a civil servant. She appeared the IAS exam and cleared in 1967. In 2005, she got success to bring the crucial change and in establishing the Right to Information Act (RTI) .She was well known as a prominent leader of the Mazdoor Kisan Shakti Sangathan which was the social and grassroots organization for the empowerment of workers and peasant. She has received various awards for her service given to the society. She was born in Mumbai ,she was having temptation to work for society and shown her interest in public service at early age. She initiated to understand the problems faced by the underprivileged and realized to give helping hands and to serve them. Her mother was a member of Swadar, an organization formed to assist and to work for women support who were financially weak and helped them to get educated. Her father played an active role for the Indian Independence Movement. She was least bother about her position and have left aside her PhD unfinished . She had completely involve herself in the tribal and peasant communities in Maharashtra, Madhya Pradesh and in Gujarat. Known best for founder member of the famous Narmada Bachao Andolan. She is known as a social activist and the first woman IPS officer in the country. She was born and bred in the holy city of Amritsar, Punjab. She has not only served her department with her full dedication but has also made whole hearted contribution to many social causes, she worked for bringing down the number of crimes against women in West Delhi during her service. Have also introduced many reforms at Tihar Jail,which gained worldwide acclaim and won her the Ramon Magsaysay Award in 1994.In 2003 she became the first Indian woman to be appointed as Police Advisor to the Secretary-General of the United Nations in the Department of peace keeping operations. She runs the India Vision Foundation . She is a multitalented women ,an author, actress and political activist. She was best recognized for the award-winning novel “The God of Small Things” in 1997. And also for her involvement in environmental and human rights causes. She was awarded the Lannan Cultural Freedom Award in 2002,the Sydney Peace Prize in 2004 and the Sahitya Akademi Award from the Indian Academy of letters in 2006. She is an author and poet who received the Rani Lakshmibai Stree Shakti Puraskar in 2013 for her work in fighting for women rights. Born to a poor family in the state of Odisha, she travelled 15 km daily to the only school in the entire region. She was the first woman from her village to earn a law degree. She has won many accolades including the ‘Outstanding Women Award’ in 2011 from the United Nation’s UN Women and National Commission for Women. She is the founder of Nirbhaya Vahini and OYSS Women and head the Honour for Women National Campaign, a nationwide movement to end violence against women in India. She is also serving on the panel of Central Board of Film Certification (Censor Board) for India. She is a member of the International Governing Council of World Women Organization (WWO) and Inquiry Committee of the National Commission for Women. She is an Indian lawyer and a well-known women’s rights activist. She obtained a law degree at an early age and started practicing law. She is known as a maverick lawyer who fights against sensitive issues such as child labor, house and control, sexual violence at work, domestic violence and prisoner’s plight. She has also contributed in organizing various unincorporated sectors. She has been a member of the dictionary committee for English-Kannada translation. She is the first woman to be elected in the past 50 years to the Karnataka Bar Council as Chairman of Bar Association..
She is a former film actress, Bharatanatyam dancer, animal welfare activist, and a mentor to budding film students. Amala was born to an Irish Mother and a Bengali father. Very early in life, she understood the importance of being self-governing and cultured. She is also a strong promoter of vegetarianism and is the Co-founder of The Blue Cross of Hyderabad, an NGO in Hyderabad, which works towards the welfare of animals and preservation of animal rights in India. In 1992, She has long since walked away from the glitter of movie stardom and entered the hapless world of Hyderabad’s sick, beaten and homeless stray animals hoping to make a difference in their lives. She is an Indian campaigner with Stop Acid Attacks and a TV host. She is an acid attack survivor and speaks for the rights of acid attack victims. She was attacked in 2005, at age 15, by a 32-year-old man. She has also advocated against acid attacks through gathering 27,000 signatures for a petition to curb acid sales, and taking that cause to the Indian Supreme Court. Her petition led the Supreme Court to order the central and state governments to regulate the sale of acid, and the Parliament to make prosecutions of acid attacks easier to pursue. She is the director of Chhanv Foundation, a NGO dedicated to help the survivors of acid attacks in India. Laxmi received a 2014 International Women of Courage award by US First Lady Michelle Obama. She is the CEO of Teach for India, and the Founder of Akanksha Founder. She has earned global recognition for her dedication and commitment to the fight for educational equity. Born in Mumbai to a Parsi family, she had an international upbringing. However, She realized and made a goal that children living in Mumbai’s city slums are found lacked to get the education and due to that they hold no future for their job career. So she founded the first Akansha Centre in 1989 , a school tutoring to children from low income communities which was totally non-profit education project.. While we have quoted only few activists, there are many others who have contributed their whole time in helping and bringing a change to the Indian society. We salute the Indian women; however, the struggle is still on. As Alice Walker once said, “The most common way people give up their power is by thinking they don’t have any”. Each and every citizen should consider it as their moral duty and obligation to help shape a better future for India. Jai Hind !!!! !